Writing in the Trib, Mustafa Tameez tells Republicans that there such a thing as too much of a good thing for them. If Republicans win in SD-10, there will only be 11 Democrats in the Texas Senate. That means that in order for the majority to pass anything it wants, all they need to do is peel off one member of the opposition (or just wait for a day when one of them is running late, or steps out to use the bathroom) and they can pass anything they like. Think about that for a moment: All that’s standing between Texas and an absolute one-party rule is a traffic jam or a sick day. I don’t care what your politics are — that’s not good. Suppose you are a large homebuilder with strong ties to the Republican Party establishment. Suppose you embrace many of the same principles as the new Tea Party members of the Legislature. But what happens when say, a sanctuary cities bill gets introduced? Will your opposition even be heard? Or will you simply be denounced as a conservative apostate or worse yet, a RINO, and dismissed from the conversation? Let’s say you’re a member of a well-moneyed group of business people who firmly believe that dismantling the trial bar in Texas is the only way to secure economic growth. What will you do if the female, minority, or gay members of your group are threatened from separate corners of the political spheres in, for instance, the realm of marriage, voting rights, or reproductive medicine? It wouldn’t take too many dust-ups like these before the vaunted “Three-Legged-Stool” is over turned completely. This is not a hypothetical struggle. This is truly about how big a tent the Republican Party is able to hold up while it is being driven further and further to the right. Essentially, with the Senate held by a virtual supermajority, the same folks who so ardently supported Ted Cruz would be running the show in Austin this coming January. Like I said: terror or delight. 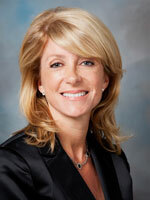 The Wendy Davis race in SD-10 should be a rallying point for Democrats and for Republicans. It should be a moment to reflect on the larger picture, and not on any one individual issue. After all, this is a fight for their survival and, strangely enough, it depends on a Democrat winning. If you think Tameez is overstating the case about the two thirds rule being circumvented by circumstance, remember that it’s happened before. I see no reason to believe that David Dewhurst wouldn’t try it again if the opportunity presented itself. Philosophical issues about the two thirds rule aside, a lot of people involved in the process like it as it is. If it’s going to be changed, we should be honest about it and not subvert it with sneak attacks. The point is this. Dan Patrick has made perfectly clear what his priorities are for this legislative session, and “sanctuary cities” is one of the things on his wish list. Establishment Republican types like Bob Perry and Bill Hammond have been all talk and no action when it has come to pushing back on anti-immigration hysteria in the Republican Party. The SD10 race is a perfect opportunity for these business types to do something about an issue they claim is important to them. If they can’t bring themselves to actually support Sen. Davis – and by the way, a Republican win here would likely make it that much easier to do away with the two thirds rule entirely, this making it that much easier for Dan Patrick to impose his will – then they can at least not actively oppose her. The more Dan Patrick gets what he wants, the less he’s going to feel he owes to anyone who isn’t with him on each and every one of his issues. Like “sanctuary cities”, for starters. What kind of Senate do you want, establishment Republican businesspeople? You have the power to help decide. This has an Alamo vibe about it. I don’t recall that Colonel Travis ever sent a letter to the Mexican army asking for help, so perhaps the analogy doesn’t quite match up with begging Republicans to come to the rescue of the last Democrat in the Senate before it falls. My experience with the GOP is that they’re not much for intellectual arguments, though it is certainly true that Bob Perry butters his bread on both sides (of the aisle). Could this premise work for Paul Sadler? Nick Lampson? I realize they are not nearly as progressive as Davis, so I don’t know if that hurts or helps. I suppose I’ll just watch what develops with fascination like everybody else. Uh huh. And of the 16 member city council, you feel there should be how many Republicans? Seems like you want to push them into exactly two seats: G and E. So with the mayor also voting, you want a 15-2 “balance”. You have some odd ideas, JJ. For the record, I voted for CM Costello in 2011. If Council ever starts acting like the Senate and/or the House, we can talk about how best to deal with it. No one with an ounce of awareness thinks Costello is a Republican. He never, ever votes contrary to Annise Parker, the most vehemently activist Democrat mayor we’ve had in years. His campaign contribution history, as evidenced in his finance reports, says otherwise. I haven’t checked, but I’d be willing to bet his primary voting history also says otherwise. But whatever you say, dude. You obviously know these things better than anyone else. I will freely admit that Costello is not a typical Republican. He’s rational, well-informed, and actually cares about governing. I’d be happy to have a lot more people like him anywhere in government. I can confirm that Costello is a regular Republican primary voter. He has also regularly attends GOP meetings of clubs and precinct chairs and speaks about city issues. Just because he does not vote publicly against the Mayor, does not mean that when he has disagreements with her that he seeks to privately reconcile their contrary positions. He probably just doesn’t see any advantage in being confrontational in a strong-mayor system of government. Nonetheless, some shrill voices in the GOP continue to try to push him and other more centrist types out as heretics for supporting a role for government in infrastructure and quality of life issues. He and Anne Clutterbuck, maybe Oliver Pennington, are probably the only Republicans who could win mayor, precisely because they are willing to work across the aisle. That said, I think Costello’s interest in the “food desert” issue is a bit silly, based in anecdotal data, and neglects the security issues underlying decisions about siting of grocery stores, and customer preferences and economic forces.